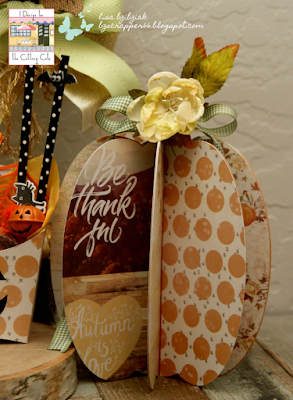 Life of a BZscrapper: Cutting Cafe Inspiration-Pumpkins and Autumn Goodness! Cutting Cafe Inspiration-Pumpkins and Autumn Goodness! Welcome to some Cutting Cafe Inspiration! Today we're all about the Pumpkins... and just some general yummy Autumn Goodness! I'm sharing a couple new projects along with one I previously posted that may recognize or maybe you didn't see it yet! I made all of these with the same Prima paper pad so I thought it would be fun to gather them together for today. I made these with the Fun With Fry Boxes file! These are so SUPER easy and quick to cut and put together. The file comes with a few different styles of boxes... I used the plain and the pumpkin face. Some have windows and some don't but they are all adorable. And I've stuffed mine full so you can't see it now, but I used a coordinating paper for the inside layers. So cute and as you can see they hold a lot of stuff! I'm all ready for an autumn crop, right? What a great gift to find at your table! This was made with the awesome 3D Pumpkins cutting file! This is the medium sized pumpkin from the set. I pulled the file in and sized accordingly before making any changes. I ended up cutting eight full, scored pumpkins.. but you can cut as many or as few as you like! The more you cut, the fuller the pumpkin, but the less you will see the paper. And the fewer you cut... well.. you get it! This set does come with a beautiful leaf (which I did cut and will use later on a different project), some pretty tendrils and a pumpkin stump, but I used a thread spool (which you can't see here...lol) and some pretty ribbon and some flowers and leaves from Petaloo to decorate the top of mine. I did reinforce some of my folds with some score tape because I'm a little rough with my stuff and it's quick and easy enough to do that I'll probably just do that with all of them for the next one I make! I also cut layers to put over the base pumpkin pieces (this cut is also included) and I love the way it really makes the pumpkin sturdy. And then there's this! I made this when we had some fun with Rosettes a little while ago... and I have plans for something else with this fun file so look for that soon. But for this one I made a flower... the base is a large spool and it is two sided and you can check out the other side at this post if you'd like! Don't you just LOVE Autumn! And I love how easy it is to create cute decorations with some pretty paper and a few cutting files from The Cutting Cafe! Now be sure to head on over to the Cutting Cafe Blog to check out today's post! Comment there for a chance to win three files of your choice and then see what everyone else has created for you today! Thanks for stopping and Come back soon! Ohhhhhh how fun! LOVING those fry boxes and the colors of everything!!!!!!!!! 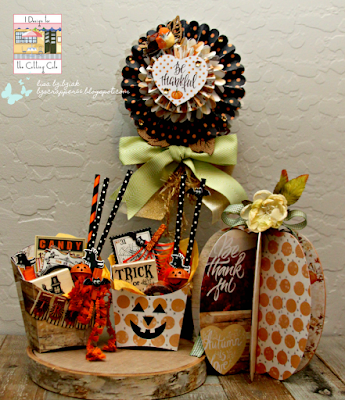 Beautiful projects for Fall and Halloween. The crafting queen has been busy as a queen bee doing lovely art work --- send it all to me! LOL - love it! 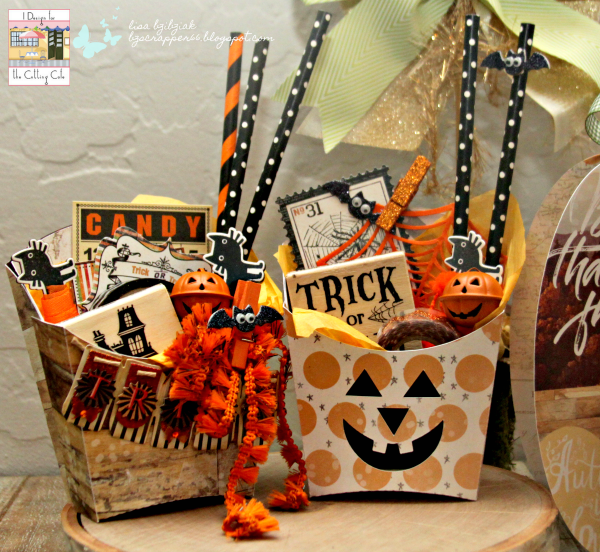 Super CUTE projects Lisa! Love your Halloween and Fall themed gifts! love everything about this set! CAS-ual Fridays Challenge #209 - Sketch! Giving Thanks and a Fun Meet! Paper Sweeties September 2018 Release Day! CAS-ual Fridays Challenge #208 - Sequins! Graciellie Christmas Cheer AND A Contest! Ink Road and Some Alcohol Lift! The Cutting Cafe - Designers Choice! Three Amigos Blog Hop Challenge #18 - Fun Folds!